Worth a thousand words? Justin Bieber was photographed shortly before being arrested for DUI, drag racing and driving with an expired license in Miami Beach, Fla. on Thursday, Jan. 23. 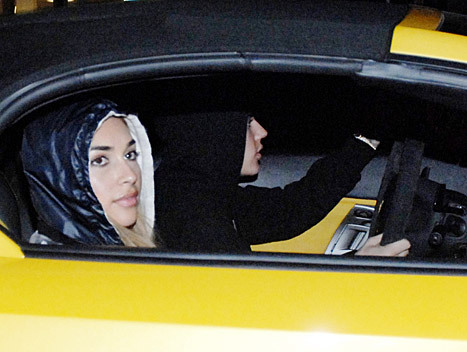 The 19-year-old singer was spotting leaving SET night club and driving away in his yellow Lamborghini with model Chantel Jeffries. Wearing a black hoodie, baggy black leather shorts and red sneakers, Bieber tried to hide his face from cameras while exiting the club with an entourage. The insider tells Us the "Baby" singer left the club with a big group. The teen heartthrob was photographed leaving the nightclub behind the wheel of his sports car, with Jeffries in the passenger seat. According to the police report, obtained by Us, officials observed yellow and red Lamborghinis racing each other at approximately 55-60 MPH and made two traffic stops at approximately 4 a.m.. The report states that the arresting officer "smelled an odor of alcohol" from the yellow Lamborghini, and describes Bieber as having "bloodshot eyes" and "a stupor look on his face." According to the officer, Bieber kept digging in his pockets and cursing during the pat-down. "What the f–k did I do? Why did you stop me," the singer reportedly asked. "I ain&apos;t got not f–king weapons. Why do you have to search me? What the f–k is this about?" "I advised the driver that if he continued to take his hands off his vehicle, he would be subject to arrest," the officer states in the report. "The driver again turned around to face me. At this time, I grabbed his right hand and stated to him that he was under arrest. The driver began to resist me by pulling his right arm away as he stated: &apos;What the f–k are you doing.&apos;"
The driver of the red Lamborghini, 19-year-old singer Khalil Amir Sharieff, was also arrested for DUI and drag racing. "I was met with the odor of marijuana coming from the passenger compartment of the vehicle," the police report for Sharieff, obtained by Us, states. "I asked him for his license and he was able to provide it. I noticed that his eyes were glassy and his speech was slow. He had a dazed appearance on his face." Bieber&apos;s mugshot was released later that morning, and showed the teen smiling for the camera. He faces charges of resist without violence, DUI and driving with an expired driver&apos;s license of six months.